Rated 5 out of 5 by Sheesh4 from Great, Fun, Intriguing Game This was an extremely fun game! The puzzles were unique, challenging, and fun. The storyling was interesting and intense. The journal notes were funny and realistic. The music was great and not tiresome. The graphics were, as usual, amazing and realistic. Every scene was something new. There wasn't a point where I was puzzling too much over what to do. Everything was pretty straightforward. Overall, anoher great game by Elephant Games!!! Bravo!!!!! Rated 5 out of 5 by 77Emma77 from Easy to play game This was probably one of the first Mystery Trackers games. It was very simple and easy to play. I have probably grown up from such simplicity. But I still rate this game very high as others did. The objects were very well blended with the background, the sounds and voices were great, I loved the frog sounds here and there. Also the piano song was very lovely and refreshing, if it only did not stop suddenly, before I finished looking for the objects. The best came at the end: various recordings for different phone numbers. I enjoyed listening to them. There were some hints for the solution of some puzzles, but they were so easy and obvious, that I often found the sheet of paper with the solution after I solved the puzzle. Very good game for its category. Rated 5 out of 5 by dapperdan1 from Fantastic Game! 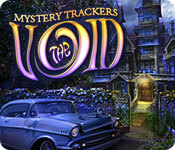 I absolutely love all the Mystery Trackers games. I have yet to play one that wasn't great. Beautiful graphics and HO games were pretty easy. Love these games! Definitely recommend them. Great games for beginners. Rated 5 out of 5 by mouser9169 from Some games age like fine wine And this is one of them. This review is based on a completed playthrough of the standard game. This is the second Mystery Trackers game I've played. I was very underwhelmed by Silent Hollow (see: my review), but decided to give the series another chance by going back to its roots. I'm very glad I did. THE GOOD: Graphics were nice, clear - the HOS were well lit. That's not to say they were 'easy', but they were difficult because things were well hidden, not because your eyes couldn't make them out in the dark corners of a blurry screen. There was also one HOS of a 'small' item, so all the things you normally have to squint for (like thimbles and safety pins) suddenly loomed large on your screen. Music was good (except for your car radio...), not too obtrusive. I didn't feel the need to turn it down and it kept the pace of the game up. There's only one difficulty setting, but it's not too bad: sparkles on the HOS and few 'glints' here and there, but you still had to look around for a lot of things. No map, which I normally would list in the 'BAD', but it worked here. You only had a small section of 'rooms' to deal with at any one time, and finding those rooms was part of the challenge: a map would have ruined some of that. Diary/Journal: Keeps track of things you find as well as 'your' thoughts of the case. Gives a brief history of your 'Order'. 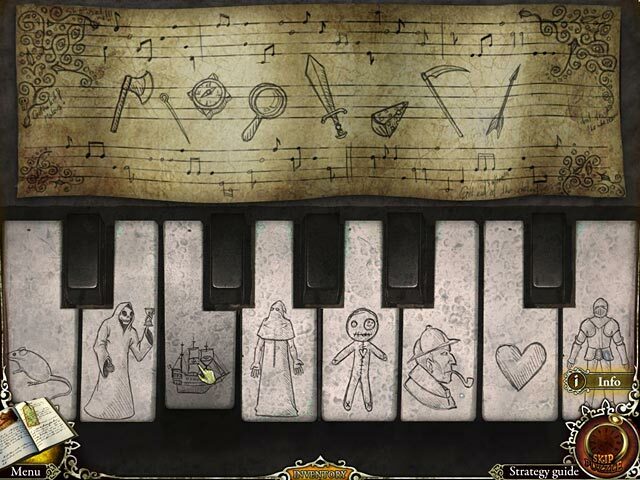 Some of the pages are marked 'Secret': these are hidden pages that generally give you the solutions for mini-games (you can solve them without this). It's also filled with pop-culture references, and the Ogdoadic stars in the game could be taken as a sign to your Order's lineage. Very nice touch. THE BAD: Just the one difficulty level. Much of the game follows the 'You need a thing, you find the thing' pattern. Though it does get better around the middle of the game, you never really get a full inventory or are faced with more than a couple choices of what to do next. THE UGLY: Only a few little things: Your journal 'uncovered' as you went along - this meant you could have blank pages between one entry and the next until (or unless) you found the stuff in the middle. At the very end *slight spoiler* you find a gun in the villain's car that you need to find a bullet (who am I Barney Fife?) for - but there was a perfectly good revolver in your own glove compartment that you left behind... BOTTOM LINE: A solid game - gave me more than five hours of playtime. 38 HOS and 38 minigames (according to the achievements) of easy to medium difficulty. One pretty good 'slider' puzzle and a 'single line' checkers were the toughest for me. After playing this title, I can understand why this series has so many fans, and I now count myself as one of them. Hoping the rest are up to this level, with my first being the 'fluke'. 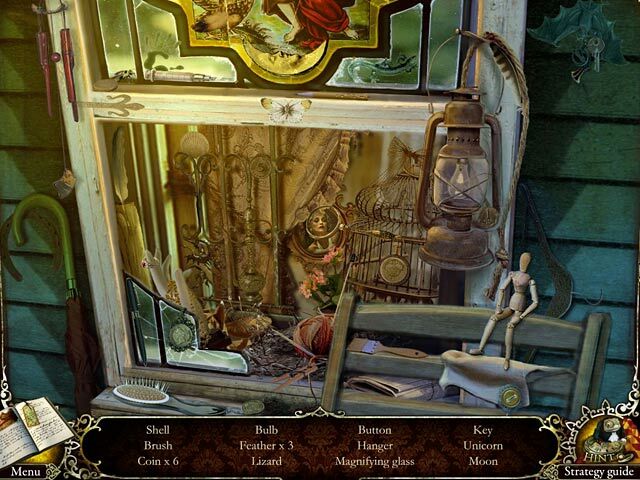 Rated 5 out of 5 by Wisejay21 from great game This is a great game, loved the plot and the many hidden object screens. The background sound effects got annoying after awhile, but had to listen to them to get sound clues on some puzzles. Other than that totally loved it. We need more games like this that focus on the hidden objects and less on picking up random objects for inventory. This game is a good balance between them. Rated 5 out of 5 by JustTheFacts from Wonderland Of Invention BASED ON COMPLETED GAME FIRST IMPRESSIONS Hard to believe this is the first of the Mystery Trackers series. It is such a sweet and simple game compared to the hard hitting, spectacular sequel Raincliff, and all that have come since. Yet you can see the quality and excitement in this game that are characteristic of all these games. Although a quiet start, the tension builds quickly and the mysterious atmosphere lasts the whole game. SIGHTS & SOUNDS There is no widescreen option, of course, and the graphics have aged a little, but are artistically delightful and on most monitors, you’d not see much difference from a decent game made today. And the colours are bold and bright, the HOPs cleverly designed to misdirect the eye while remaining clear enough to see. I did find an occasional item difficult to find because of the age of the graphics, but they were few. Being a little more mature, shall we say, there are few animations and the HOPs are less fun because of it. The background sounds are great. There are frogs in the pond, and rain dripping into it too. There are spooky noises in the house, and some wonderful booms and crashes. The music is mixed. Some I liked more than others. Voices don’t play much of a part in this game, but they are used to get effect. Love the radio in our car. WHAT’S HAPPENING? We belong to a quasi-secret society called Mystery Trackers and we have been called in to investigate the disappearances of 3 famous people who have visited the mansion of recluse-inventor Malleus Void. Well, nobody rolled out the welcome mat for us, so we’ve had to improvise. The things we find in the mansion will both amaze and shock. And the mystery will become ever more intriguing. GAMEPLAY Nicely simple gameplay, considering the series’ tendency to be a bit tougher in more recent games. There are HOPs and other mini-games/puzzles in equal number – 38 each. Which makes it a very long game. Even I could not play it in one sitting. The HOPs are simple word lists, and as you progress you are required to get more and more multiples of some of the items. The puzzles, too, increase in difficulty as the game moves forward. The adventure side of the game is at its most simple. You rarely keep inventory items for long, and the game seals off behind you once you are finished with an area, so there is never too many locations to work on at once. There is no map, but hint is literally a hint. Not quite the answer, but enough for you to know where to go and figure it out. The journal receives a lot of information, and some of it is necessary, so it is good to read it regularly. BLING! This game has 12 achievements, which are mostly story related, but there are a couple of performance based ones. COMBINED IMPACT I surely did love playing this game, especially just after playing the latest in this series. It’s certainly not as sophisticated as its brothers, but it is a sweet game with a lot of imagination and verve. Rated 5 out of 5 by MisterLimpet from Another Excellent Production I love searching for items that are part of a well told story that has a goal to reach. This game kept me challenged, occupied and provided good, solid entertainment. Thanks! Rated 5 out of 5 by rosekaufmann from PLEASURE TO PLAY LENGTH: 5 hours SUMMARY: Investigate the mysterious atmosphere of Void’s to find out what happened to 3 celebrities who disappeared in Void’s manor. Highly-polished game with lots to do and see in well-constructed and beautifully detailed environments. Story is skillfully told at a good pace; ending was rather abrupt, but brings closure. A pleasure to play. DETAILS: - Plenty of HOS – some are very crowded while others are busy only in spots. All objects are crisply detailed with good visibility, but are sometimes near the very edge of the screen, so don’t forget to look there. No tiny or blurry objects that are easy to miss. - Lovely detailed graphics beautifully define environments. Wonderful color palettes. Looks lovely. - Cutscenes separate chapters. Each chapter begins with no inventory. You need to read the journal to understand the entire story. - No map is needed because each chapter has limited environments. So not much backtracking. - Wide variety of fun puzzles – most are moderately difficult (although some are quite easy and some a bit more challenging). Not an inordinate amount of doors to open. 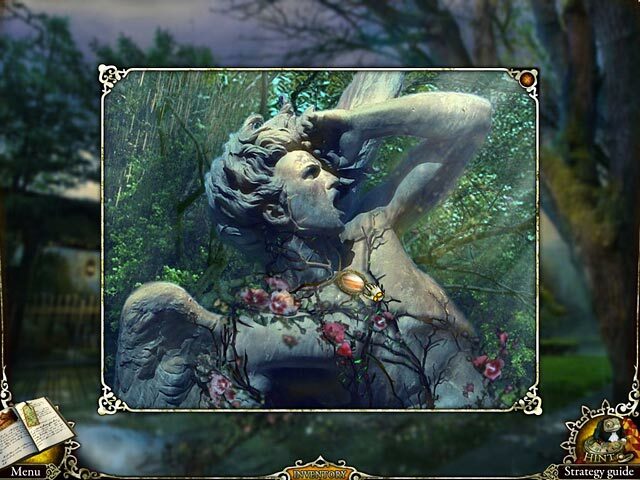 - Journal has a lot of background information, as well as plenty of puzzle solutions. - One of the most helpful hint systems – tells you what you need to do with what inventory you have. Rated 5 out of 5 by qmsterling from Loved It This is my first Mystery Trackers game. The visuals were great, the gameplay not too difficult, and would definitely recommend. Liked it so much that I am now playing the other MT games.